Our colleague and friend Shannon Moore has died. For any in the Gulf Coast trenches — at your computer or wading through the muck — Shannon was alongside you in some way. Her dedication was unsurpassed. Please keep Shannon and her family in your prayers. Graveside services were held Tues, June 6, 2006, 9:45AM at Metairie Cemetery. "Shannon, we will see you again at the Rainbow Bridge"
Today I awoke in a sun-filled room. I'd dreamed about my trip to New Orleans to finally meet you and stay in your home. In that hazy rift between sleep and wakefulness, I did not remember you were gone. I forgot to tell you: When we worked on Louisiana's Pet Evacuation Bill materials, you were so patient and kind. I was the stress machine. You thanked me many times for the PSAs, releases, and letter campaigns. That was your way, at least with me... I began to look forward to our conversations. Because, as women do, we'd passed from "professional" to personal. A bond had formed. I miss you Shannon and have this insane urge to call you. I forgot to tell you: Thank you for your help when my puppy, rescued from a Missouri puppy mill, came home with a parvo-like condition, coccidia, giardia, and two little legs with missing bones. While Mandy was hospitalized on IV fluids, you called and called. You consulted your veterinarian uncle for advice. You were just there, unconditionally and completely. I wish you could see Mandy now. She is a spastic fluffball. We call her the walking "hair-do." I forgot to tell you: We were kindred spirits, you and I, with that precarious dose of passion and pain. Needing approval, but forging ahead, obsessively so. The last time we talked at length, I wanted to share a hundred more stories. You were a comfortable ear. I could open up, as you did with me. I don't connect easily. I grieve the friendship we lost and the one that would have grown. For you Shannon, that line between valor and sorrow was thinly etched. People who practice compassion -- not on a whim, but as their core -- waken to daily questions: Can I save just one? How many can I speak for today? The fragile heart feels too much. Sees too much. Hears too much. Empathy gives way to anger and confusion. To experience the fear and pain of infinite animals can break the soul. Without a lifeline, isolation becomes unbearable. I can never know the depth of your despair in those final hours Shannon. Like many who knew you, I am plagued with a thousand What-Ifs. I do know the world has lost an imperfect angel. A gentle spirit who could no longer find reason for hope. I know you'd think this letter is a mush-fest and it would probably embarrass you. But the thing is, I forgot to tell you how much I cared. ...A haunting tribute...there are no existing words or expressions to describe your love and devotion to Shannon...and your soulful passion for those innocent, vulnerable creatures who are the closest things to God, that God created. God Bless You Always Brenda. Hi Shanonn.I never knew you.from what I hear you fought for animals every day of your too short life.The love for animals brings people from all over the world together for the same reason.To say enough to the ones who abuse and torture maim and kill innocent animals.You are there now at the rainbowbridge.To give love to those who never knew what love was. The heavens rejoices as a new angel is among the manny already there.The work you have done is an inspiration for others to follow.You have inspired me to go on with my work and vocation in this life namely to speak for those who can`t speak for themselves. I thank you for that courage to speak up and say enough. I shall do the same.not because you did it,but because it is part of who I am,and what I do.regards from a greyhound advocat. Shannon Moore’s work for animals leaves an imprint that transcends her death. Although Katrina ravaged her own home and possessions, Shannon looked into the eyes of forgotten animals and saw hope. She never viewed animal storm victims as a finite problem, but rather, as part of a continuum to elevate animal welfare standards in Louisiana. Shannon planned and carried out a People & Pets March to Louisiana’s state capitol in Baton Rouge. She was instrumental in rallying support and awareness about SB-607, Louisiana’s Pet Evacuation Bill. Working with Kinship Circle’s Brenda Shoss, press releases, PSAs, alerts, flyers, and action campaigns were streamlined into a non-stop push to pass a bill that ensures no pets are left behind in the next disaster. On behalf of the animals she loved, Shannon formed (SOS) Supporters of Save Our Pets, and worked tirelessly to save the lives of hundreds of thousands of hurricane stranded animals. Shannon volunteered for food/water programs to sustain displaced pets and strays in the streets. She advocated spay/neuter drives to help curb a pet overpopulation crisis worsened by roaming animals in the aftermath of last year’s storms. Shannon realized most of the lost souls she comforted knew warm laps, familiar voices and homes before the hurricanes. She became a Stealth Volunteer to assist in reunions between pets and their people. 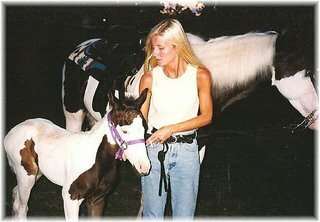 Horses were Shannon’s great love, and to help them she created the HayThere group to assist hay producers and consumers via an online marketplace for hay and feed goods. the huge quantity of food and supplies she moved for large and small animals struggling to survive in Gulf Coast areas. She was a one-woman information clearinghouse. Any animal rescue group who needed statistics, a news story, or contact information counted on Shannon. Shannon practiced compassion in an unassuming way that never called for recognition or accolades. She simply embraced the lives of people and animals as if they were her own. Shannon Moore was a friend, daughter, wife, and angel for animals. We’ll feel her presence in her many great achievements. Still, we will miss her everyday. We have all been blessed to have such a huge human being touch our lives. HeR work will never be forgotten, warm and sincere memories are what the tools that walk us through our daily lives. God bless and wrap your arms around our hearts that we may stay strong to fight beliefs and continued rescue efforts for god's animals that bring us love in our saddest and happiest moments. I pray so hard that we may unite and bring peace, love and brothership to one another, this will be God's will. Click the "Comment" button below to display any messages you'd like to share. I didn't know Shannon, but her name passed through my email inbox many times. I'm sure she is happy and at peace with her animal family. Shannon was the protector of God's earthbound angels. Animals are the closest things to angels. She is now with her beloved angels, at peace. God Bless the "beasts" for they are our children. God Bless Shannon, as she is a Child of God. Her good works and heart of gold has not gone unnoticed. Oh, Shannon, I never got to meet you in person, but your name was all over everywhere during and months after the Katrina disaster. You worked tirelessly, create so many groups and efforts and loved your animals dearly. You will be sorely missed. I know you are at peace now at Rainbows Bridge with all of your beloved animals. And I know you are still looking down on us and cheering us on with our continued efforts to save all of God's creatures, human and next to human, our precious animals. I never met you Shannon, butyou were the kind of person I would have loved to work with. Your compassion for our little friends was something fantastic. I know one day I will meet you at the Rainbow Bridge with all my departed friends(4 legged)there to greet me. I didn't know Shannon. But I wish I would have. The world has lost a wonderful person, a protector of the animals. Dear Shannon, I never heard your name before today, but I know you. I don't know what happened, but I want you to know that I understand. I know that overwhelming feeling, all too well, of despair, hurt and anger that so often comes with compassion. I am a rescuer and advocate, too. It is the kind of feeling that comes from within, there is no clocking in or out, nor taking a vacation. It is a drive to succeed, but more often than not the goal seems truly unattainable. I know that you needed more support; we all do. I wish that I could have offered that to you while you were still with us. Thank you for the impact that you made while you were here. You made a difference. Caring about innocent animals caught in Katrina’s wrath doesn’t diminish human suffering. It makes us human. In lieu of flowers, Jennie (Shannon’s mom) and Robert (Shannon’s husband) have asked that donations be made to Alley Cat Allies. When you donate, please state In Shannon Moore’s Memory. Feel free to donate to other nonprofit animal organizations helping in the Gulf Coast. Southern Animal Foundation is a no-kill, 501(c)3 non profit, animal rescue, shelter & adoption agency located in New Orleans. Make tax-deductible check to SpayMart, Inc. Animal Aid for Vermilion Area, Incorporated, is a 501(c)(3), helping the people and animals of south Vermilion Parish areas and its neighbors: Cow Island, Forked Island, Pecan Island, Esther and InterCoastal City. Family know that her Spirit is continuing to do her good works.